The ZW-1 is a pelvic stabilizer brace that provides compression to the hips to maintain stability and prevent the SI joint from rotation. Light support narrow belt to enhance pelvic stability and enable natural ante flexion and rotation. 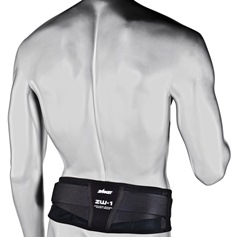 The unique taping system prevents the belt from slipping during vigorous movement and the adjustable non-elastic straps help stabilize the core. Ideal for pelvic stability.